This unique necklace from the Pompadour Cascade series features an adorable vintage crystal glass bead (approx. 11mm in diameter), vintage brass link, czech preciosa crystals and cascading vintage faux pearls that come from a japanese 1950 pearl tassle. The ribbon is silk and can be tied as you like. The pendant looks particularly alluring when worn short, choker style. If you wish you can also remove the ribbon and put the pendant in a long chain of your own for a different look. It's a versatile style! Length of pendant is approx. 12cm. The third photo shows this pendant on a torso alongside Cascade chain necklace, also available in another listing in this shop. 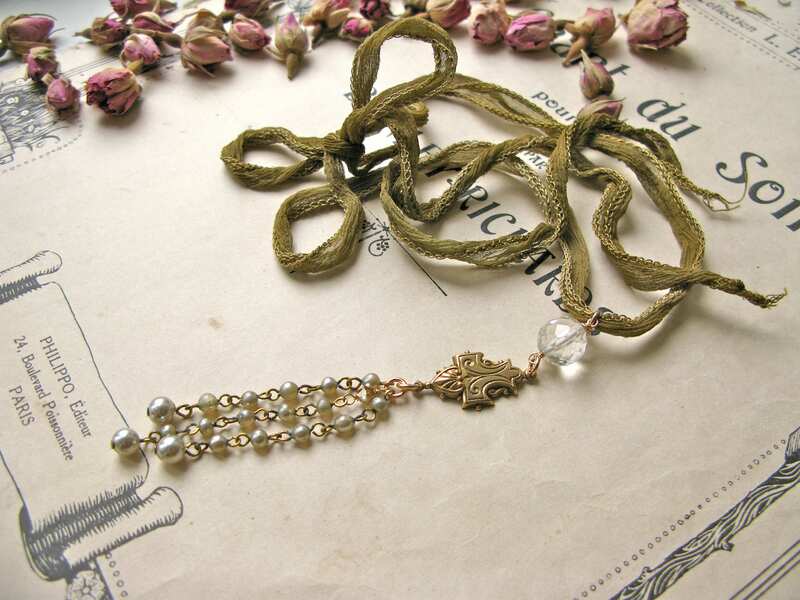 These necklace has the ultimate "shabby chic" look. The materials are old and show some aging, but I have cleaned and polished them as much as possible and made sure that they are in good condition. Some of the pearls are showing age on the coating and the brass links holding the pearls together are partly oxidised. However, I think this simply adds to the beautiful vintage look of these charming and rare materials! Handmade with love and care in my little studio in Helsinki from vintage and new, great quality materials!